The looming threat of Tropical Storm Michael is upending the already hectic campaign season under way in the battleground state of Florida. The storm is forecast to smash into northwest Florida as a hurricane by midweek, and its approach had candidates scrambling Sunday to rearrange their plans. 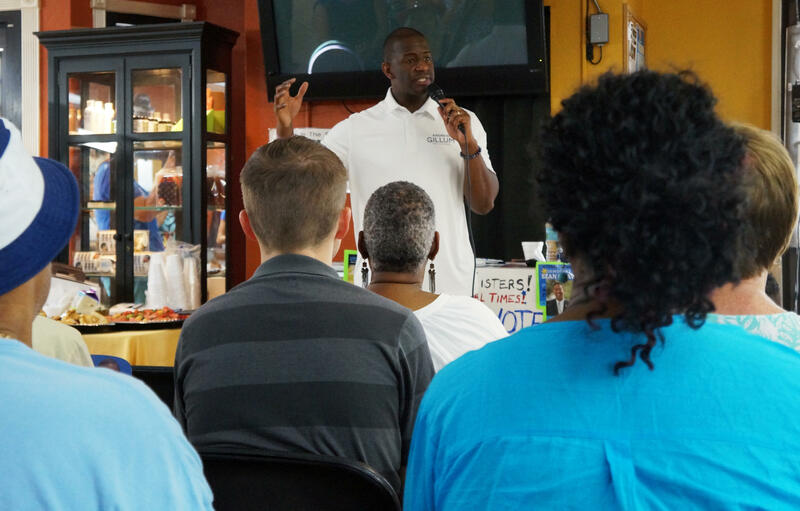 Democratic gubernatorial candidate Andrew Gillum's campaign said he was canceling South Florida events planned for this week and that he was returning home to deal with storm preparations. Projections show the storm appeared increasingly likely to strike the state in the Florida Panhandle west of Tallahassee. Gillum is already under fire from Republicans who are running television ads that fault the Tallahassee mayor for power outages following Hurricane Hermine in 2016. Gov. Rick Scott and Gillum engaged in a public feud at the time over whether city officials were doing enough to get electricity restored in the heavily tree-lined city. Gillum, who as mayor is actually one of five officials that oversee city government, does not directly control the city-owned utility. But he was forced two years ago to answer questions about why Tallahassee officials turned down help from at least one outside utility company at the time. His campaign has contended that the ads being paid by the Republican Party of Florida are false. U.S. Rep. Charlie Crist, who is now a Democrat but was elected governor as a Republican, called on GOP nominee Ron DeSantis to cancel the ads, saying he should "unite with the rest of Florida, take down his false attacks ads, and help those facing down this coming storm." DeSantis's campaign has not said if it would ask Republicans to stop broadcasting the ads. But DeSantis put out a statement on Sunday saying that he was redirecting his staff and volunteers in northwest Florida to work on storm preparations instead of the campaign. Scott hinted briefly at the 2016 confrontation between Gillum and himself during a late afternoon media availability, saying it was important for local utilities to have mutual aid agreements to ensure power is restored quickly. Scott, who talked to Gillum directly on Sunday, said "my job is to work with everyone" to make sure communities are prepared. The storm threat is also forcing Scott, who is challenging U.S. Sen. Bill Nelson this year, to take a break from the campaign trail. He spent the day huddling with state officials and discussing emergency preparations with local officials. He also activated 500 members of the Florida National Guard. Scott was scheduled to be in Orlando on Monday when President Donald Trump visits the state. The White House says Trump will address the International Association of Chiefs of Police about law enforcement issues and securing the border with Mexico. Scott has made his handling of past storms a theme in one of his current campaign ads.